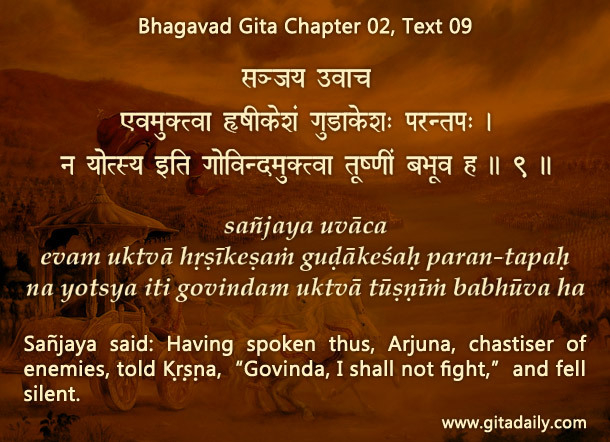 The Bhagavad-gita is spoken just before a major war against vicious aggressors. And yet at that critical moment, the foremost virtuous warrior, Arjuna, loses his will to fight (02.09). This setting demonstrates the scary power of our thoughts. A warrior on whom thousands of soldiers and millions of citizens had pinned their hopes; a warrior who had trained lifelong for this climactic confrontation; a warrior whom the best opponents had never defeated till then – such a warrior was defeated without a single arrow being shot. How was he defeated? In his thinking. We too have to fight against various difficult situations, even if our fights aren’t literal or physical. Amidst such difficulties, if we let negativity overwhelm us, we lose the battle in our thoughts. Thereafter, we either give up the outer battle or fight it half-heartedly, setting ourselves up for failure. To prevent such inner defeat, we need the firepower for winning our inner war, for molding our thoughts positively. Gita wisdom equips us with an empowering self-understanding, explaining that we are souls, parts of God, Krishna. He is our greatest well-wisher, and he orchestrates everything in our life for our ultimate well-being – we just need to lovingly harmonize with him, avoiding the obsessive pursuit of worldly gratification and redefining our work as a form of worship. When we connect with him by practicing bhakti-yoga, that divine connection calms and clarifies our thinking. We learn to see beyond our specific worldly situations, however disheartening, to the benevolent divine disposition. Appreciating our devotional positivity, Krishna guides us to find the best way ahead (10.10), thereby maximizing the likelihood of external success. And irrespective of externals, by connecting with Krishna, we ensure our inner success, learning to better face life’s inevitable battles and growing through them towards enduring spiritual strength. Thank you for such a wonderful understanding.